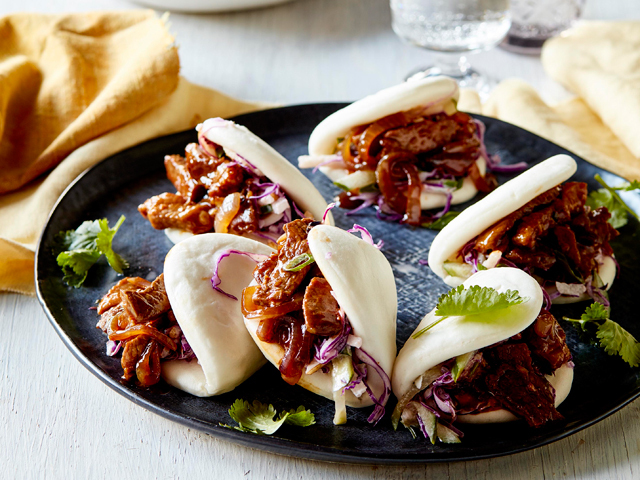 Wow – look at this Bao! This ultimate foodie trend is a must on your recipe repertoire. Place warm water in a large bowl and whisk in the potato starch, yeast and 1 1/2 tablespoons sugar until dissolved. Add the flour and mix until a dough forms. Cover and set aside for 10 minutes then lightly knead the dough until smooth. Repeat this process twice more, then divide the dough into 12 pieces and roll into balls. Cover and leave for a further 10 minutes. Roll each ball into a disc about 1cm thick with a little flour, brush the top of each disc lightly with oil then fold in half. Sit each disc on a piece of baking paper, dust lightly with flour, cover loosely and set aside until doubled in size (approx. 45-50 minutes). To make coleslaw, combine the cabbage, cucumber, pear and green onions in a bowl. In a small bowl, combine the mayonnaise, Sriracha and lime juice and stir to combine. Add 2 tablespoons mayonnaise to the coleslaw, season and toss to coat. Heat 1 tbsp oil in a hot non-stick wok, cook lamb strips in batches till browned. Remove from wok and set aside. Add a little more oil and garlic, ginger and red onion to wok; stir-fry for 2 minutes. Reduce heat, stir in Mongolian paste, and cook for a further minute. Combine brown sugar, cornflour and 1/4 cup water, add to wok and stir until boiling. Return lamb to wok, toss well to heat through and season. Heat a large steamer over a large saucepan of simmering water. Steam the buns, in batches, for 8 minutes until puffed up. Prise open each bun and fill with lamb mixture, and coleslaw. Serve with remaining Sriracha mayonnaise and coriander sprigs. Any type of cabbage, carrot or radish would work well in the coleslaw, for feel free to choose your preference.